Scott Turner is senior past president of AIME and one of the world's best-known mining engineers. He was engaged in mining operations in Tombstone, Leadville and the boom camps of Nevada and Alaska. Mr. Turner received an A.B. degree in geology from the University of Michigan in 1902. In 1904 Michigan Technological University awarded him an E.M. degree. In addition to Alaska,· Panama and Canada, he has developed mineral deposits in 17 countries. During World War I he served as an officer in the Navy. 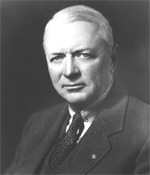 In 1926 President Hoover appointed Mr. Turner director of the U. S. Bureau of Mines. He held the position until 1934. In the following years he has served as an officer and director of numerous corporations, and as an international mining consultant and arbitrator in mining disputes. Holder of many honorary degrees and awards, Mr. Turner received the Hoover Medal in 1957. The highest honor that AIME can confer is election to Honorary Membership in the Institute. Each candidate must be recommended by the Committee on Honorary Membership composed of eight past presidents of the Institute. After an affirmative vote by the committee, recommendation is presented to the Board of Directors. By secret ballot, not more than one dissenting vote is permitted for the election of a candidate.